This entry was posted in Coursework, Part 2, The Art Of Photography and tagged "the look", AoP, aop-2, direction, implied lines, modernism, movement, weston on September 14, 2014 by Simon Chirgwin. This is the exercise where you shoot a subject that is relatively small against a fairly flat background. As Walthamstow is under several flight-paths, it seemed a good idea to try shooting aeroplanes against a cloudless blue sky. I did this on the same day as I took the ‘movement’ pictures‘ and made the horrible mistake of forgetting that for short exposures, I didn’t need to have the ISO set at its lowest and least sensitive (which was of course needed to be able to take long exposures in bright sunlight). Ah well! 2: low and to the right; on the third. 4: slap-bang in the middle! 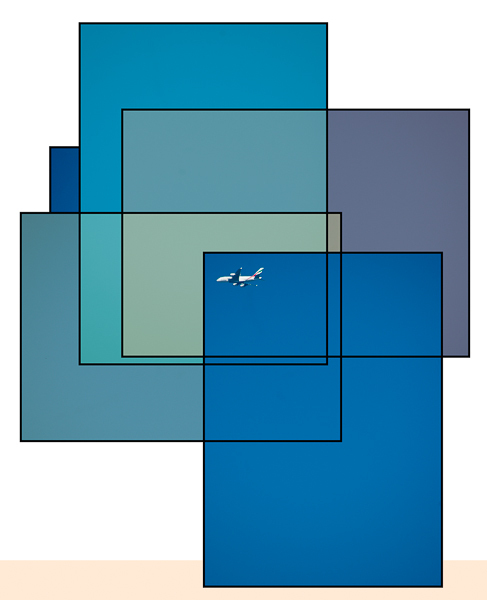 A sense of ascent somehow – the angle of the fuselage to the bottom of the frame; the space above? Most of these seem to be based on the sense of narrative given to the the picture, creating a sense of before and after the moment when he picture was taken. The impact is based on how off-balance the picture is, with the “extremely off balance” version (6) and the “equilibrium” versions (4 & 5) working less well that the off-balance-but-not-too-much ones. Also, even at 1/500th second, it was fairly hard keeping the camera steady enough for focus – 1/1000 would have been better, so I tried tracking several aircraft before I latched onto this one and managed to get more than a couple of pictures with it in the frame where I wanted it before it decreased dramatically in size as it flew off towards Heathrow. This entry was posted in Coursework, Part 1, The Art Of Photography and tagged aeroplanes, AoP, Art of Photography, framing, lea valley, lens, movement, Nikkor AF-G 70-300, sky on June 16, 2014 by Simon Chirgwin. Having completed the static camera exercise with people on foot, I decided to try cyclists for the next one where I was to pan with the moving subject and observe the difference between different shutter speeds. I moved onto a wider lens (a nikkor 24mm 1:2.8 ais) to allow for the faster moving subjects to come into shot, be picked up by me and then followed as they passed through the centre of the shot. It worked quite nicely, but I was out of the shade and in blazing sun and there weren’t enough passing cyclists. So I crossed the Lea to the tow path of the navigation, settled myself down on a bench and swapped lenses for an even wider Zenitar 16mm 1:2.8, giving a 35mm equivalent of 24mm, as the cyclists would be passing much more closely than before. Once again, the strength of the light and the limitations of my camera’s ISO settings meant that much slower than 1/15th sec burnt out too much. The closer to the camera the subject passes the more exaggerated the effect of this. Different parts of the image all combine to create a sense of movement. Everything does not have to be blurred (and indeed something frozen is definitely required). 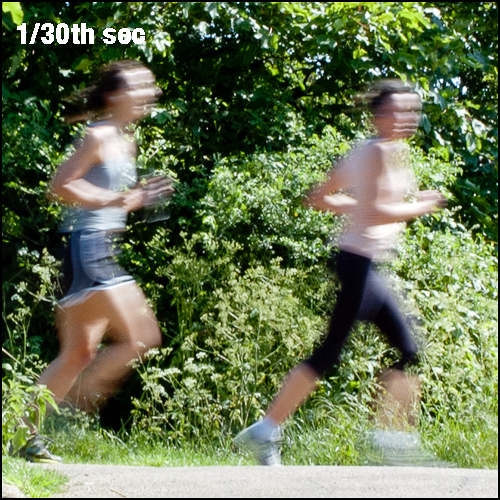 The differing levels of blur are created by distance, relative speed and steadiness of pan. As with the previous exercise, some experimentation is probably required to establish the correct combination of these for the effect you want. 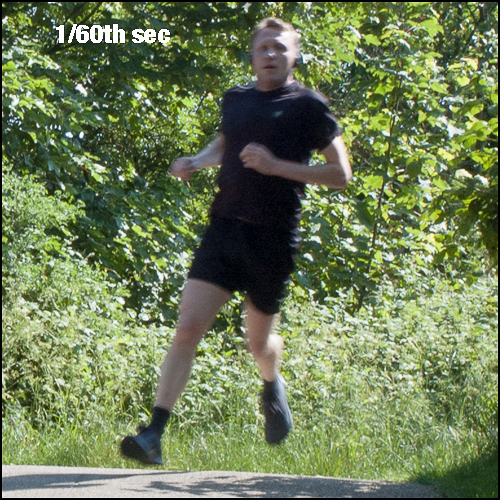 This entry was posted in Coursework, Part 1, The Art Of Photography and tagged AoP, aop-0, blur, cyclists, getting to know your camera, lea valley, movement, panning, speed on June 3, 2014 by Simon Chirgwin. Joggers, cyclists and dog walkers are found in abundance in the parkland that stretches down the Lea Valley from Tottenham Hale to the Lea Bridge Road. It seemed a good choice for the exercises featuring movement at varying shutter speeds. For the series taken with a fixed camera, I set up a Nikon D50 low on a tripod, pointing up the long stroke of a T-junction. The camera was triggered using an infrared remote. I used a 50mm lens, capable of stopping down to f22 as this would give me the widest possible range of slow speeds on what was a very bright day to be using a camera with a lowest ISO of 200. 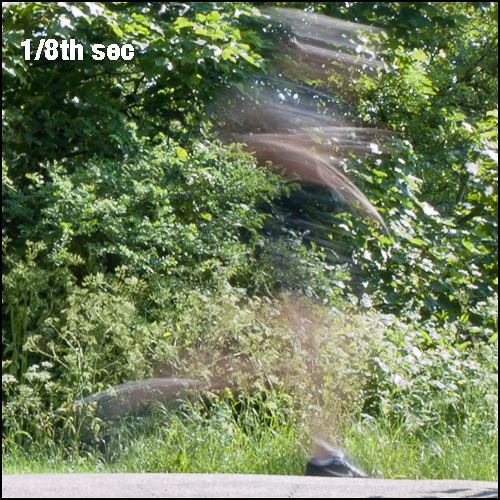 The resulting shots cover a range from 1/8th of a second to 1/400th of a second. Almost melts into the air, leaving an elongated series of brushstroke-like traces as he goes. good for a highly abstracted sense of movement. 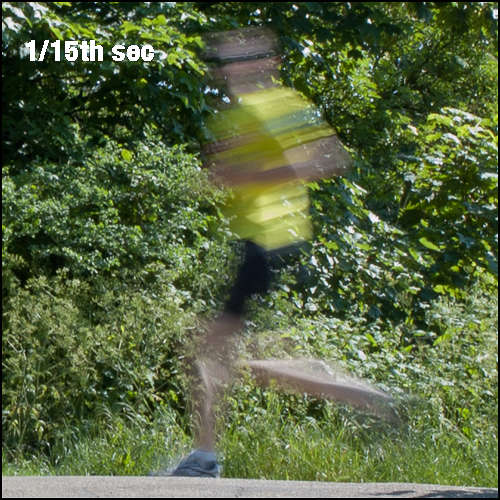 His grounded foot remains stationary for the time the shutter is open (and will only begin to move as his trailing leg moves past it and the heel starts to rise) meaning that the Nike swoosh on his running shoe is the only fully identifiable part of him. A more identifiably human presence – you can tell that a man in a yellow top and black shorts, wearing sunglasses has looked to his left as he passes the camera. 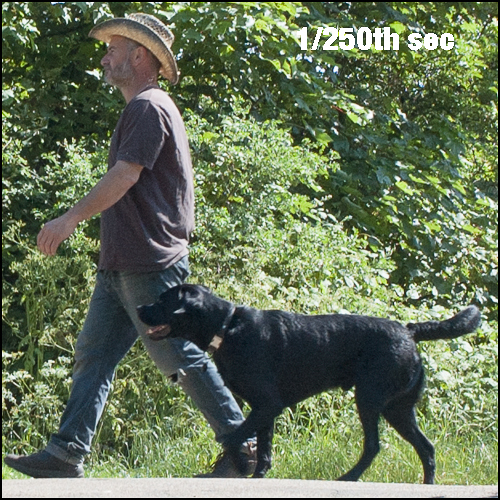 He has been caught at a different point in his stride from the previous shot and his grounded foot has started to move although his trailing leg is less elongated. Against a more neutral background I think this would work nicely. Neither figure is as pleasingly caught and blurred as in the previous shot, but the leading woman is the better of the two as she is further from the point where the two legs and arms cross the body rather than stretching out in front and behind. Gauging a shutter speed appropriate for the speed of movement is important, but so is timing relative to the stage of the action photographed. She is moving more slowly than he is but like the runner above she is simply a bit soft within a sharp frame. Presumably she has covered a similar distance relative to the camera plane. The timing of the exposure relative to her movement is nice however – she is obviously mid stride. Pretty much frozen, apart from the dog’s front-left paw. Not bad. Frozen, but not as nicely timed as the previous shot; the man’s okay but the dog’s legs are a bit of a mess in timing terms. 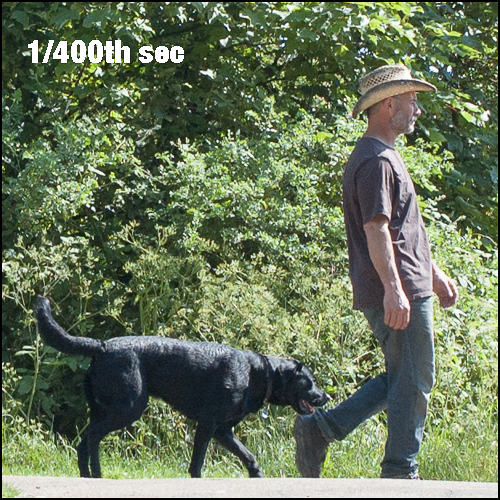 The last 3 pictures feature a couple and their labrador who wondered what I was doing and then – after I explained – offered to do the last few passes, saving me some time waiting for someone to turn up naturally. Thank you, anonymous couple – I realise I should probably have got their names, and let them know somewhere where they would be able to see the pictures, like here! This entry was posted in Coursework, Part 1, The Art Of Photography and tagged AoP, aop-0, lea valley, movement, nikor 50mm f1.8 AF-D, walthamstow on June 1, 2014 by Simon Chirgwin. Nikkor 35mm f2 AF-D; 1/60th; f22. ISO 200. A good, productive morning, taking the pictures for the last two Getting To Know Your Camera Exercises (the movement ones) and also managing to get raw material for the first two of the Framing Exercises. I headed down to the Lea Valley Marshes and spent the best part of an hour with my D50 on a tripod, focussed on a t-junction where there was likely to be a fairly steady stream of cyclist, joggers and people walking dogs, working through shutter speed and aperture combinations, and then crossed the river into Clapton, sat on a bench set a little back from the navigation’s tow path and panned with cyclists as they went past. Then, on the way home, for the first of the framing exercises (Fitting the Frame to the Subject) I noticed a unit (?) a stockade (?) – it certainly isn’t a shop or a garage – selling tyres, with a fair amount of signage outside, and decided to try a sequence of pictures of it, rather than go out again later and use a nice, orange and west-facing (so not lit yet) corner shop as the subject of the exercise. This entry was posted in Coursework, Part 1, The Art Of Photography and tagged AoP, Art of Photography, framing, lea valley, movement on May 18, 2014 by Simon Chirgwin.